Grass will grow without a lot of help, but to grow a lawn that is dense and green requires proper care. According to Ohio State University, fertilization is the most important factor in a high quality, healthy lawn. Fertilization requires proper mowing practice, aeration and watering to ensure the fertilizer takes properly. Summer is the most labor intensive part of the year for proper lawn care, but this ensures a lawn that stays healthy through the winter months and is disease-free in the spring. Take a soil sample from your lawn using a hand shovel and place the sample into a plastic container. Send the sample to your local university extension for testing. The University of Missouri Extension requires a sample from the top 4 inches of a lawn, which is a common sample requirement among soil labs. The university extension tests the soil pH level and recommends fertilizer, and whether lime or sulfur is needed to balance the lawn's acidity or alkalinity. Water your lawn regularly so that the soil receives 1 inch of water a week. During the summer this may require watering more regularly than during the rainy spring months. Place a rain gauge in the yard to measure rainfall and supplement the required amount of water from a sprinkler system or hose. Mow grass so that it is between 2 and 3 inches in length. Some grass varieties require a longer or shorter length depending on their growing qualities. Mow grass so that only 1/3 of the blade is removed at a time. This increases grass density and prevents the spread of disease. Aerate the lawn using a core aeration tool, either mechanical or hand-powered. An aeration tool removes plugs of dirt from the lawn soil, increasing air circulation to the lawn, water absorption, and fixing compacted soil. Aeration also increases fertilizer absorption, and should be performed before fertilizer application in the early spring, once the soil has thawed, or in fall between September and October, before winter weather freezes the soil. Fertilize the lawn in early spring, in April or May, and in the fall, in September or October. Apply a fertilizer rich in nitrogen, with a 3-1-2, 4-1-2 or 5-1-2 NPK ratio to the lawn at a rate of 1 lb. per 1,000 square feet, according to Ohio State University Extension. 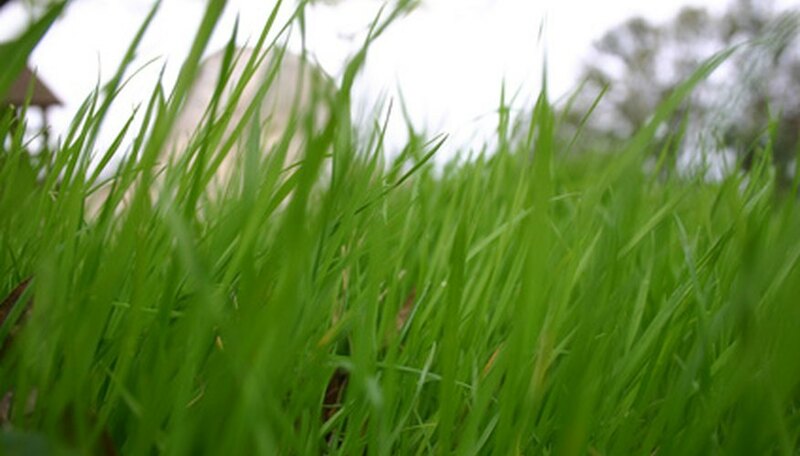 Leave grass clippings on the lawn to add nutrients and lessen the need for fertilization. According to Ohio State University Extension, 100 lbs. of grass clippings provides 3 to 4 lbs. nitrogen, 1/2 to 1 lb. pound phosphorus, and 2 to 3 lbs. potassium to the lawn. This does not add to lawn thatch and decomposes quickly.